Former feeder bluff with sediment impounded by armoring. Photo by Hugh Shipman. 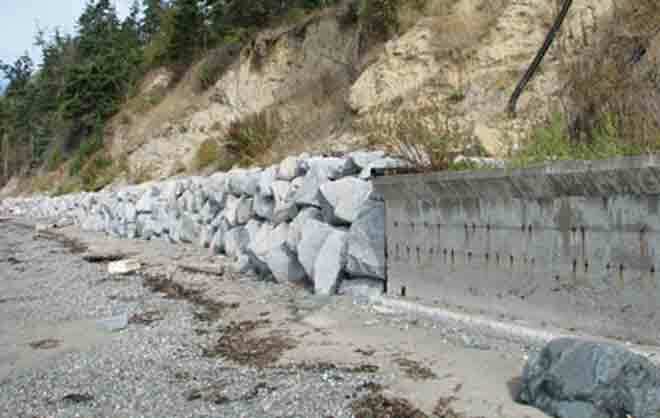 Shoreline armoring can impact a variety of ecosystem functions, goods and services provided by beaches. Shoreline managers struggle to balance genuine need for armoring to protect infrastructure versus unacceptable losses of ecosystem functions––whether these be in beaches, sand dunes, or marshes. We use our recent research effort in the Salish Sea, Washington, as a case study to illustrate how highlighting the negative consequences of shoreline armoring to publicly important ecosystem functions may help to strengthen implementation of policy and prioritize restoration actions. We focus on two distinct mechanisms of armoring impact that link strongly to key beach functions, and recommend: (1) where armoring is clearly necessary, place or move it as high on the beach as possible. Armoring emplaced relatively low on the shore is more likely to affect a variety of ecosystem functions from forage fish spawning to beach recreation; (2) prioritize protection or restoration (armor removal) of feeder bluffs that are critical for sediment supply to the beach; this sediment is essential to the maintenance of beach functions. In addition, we recommend that nature-based alternatives to armoring be given preferential regulatory consideration and that outreach efforts clarify the advantages of these engineering methods. Megan Dethier: Friday Harbor Laboratories and Biology Department, University of Washington, Friday Harbor, WA, USA; Jason D. Toft: School of Aquatic and Fishery Sciences, University of Washington, Seattle, WA, USA; Hugh Shipman: Washington State Department of Ecology, Olympia, WA, USA.